The Indiana Pacers became the first team in the Eastern Conference to advance to the second round as they made easy work of the Orlando Magic in game 5. 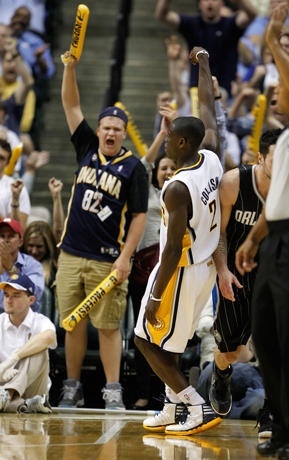 Danny Granger led the Pacers with 25 points, while Darren Collison pitched in with 19 points. Jameer Nelson led the Magic with 27 points. The Pacers will meet the winner of the Heat/Knicks series in round 2. The Atlanta Hawks live to fight another day as they held on for a 87-86 victory over the Boston Celtics in game 5. With 10 seconds remaining in the game, Rajon Rondo stole an Atlanta inbounds pass but would loss control of the ball and dribble it out of bounds as time expired. Al Horford had a huge 19 point, 13 rebound performance to lead the Hawks. Paul Pierce and Kevin Garnett scored 16 a piece to lead the Celts. Game 6 will be played in Boston on Thursday. The Chicago Bulls are still running. The Bulls fought off elimination in a very physical and low scoring game 5. Luol Deng was the Chicago catalyst, scoring 24 points. 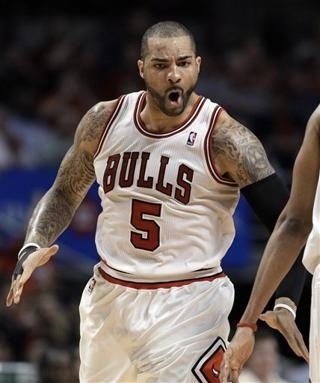 Carlos Boozer had his best game of the series, scoring 19 points a grabbing 13 rebounds. Jrue Holiday led Philadelphia with 16 points. Game 6 will be played in Philadelphia. 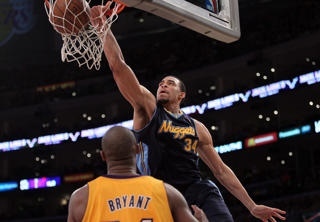 The Denver Nuggets narrowly survived a barrage of Kobe Bryant fourth quarter threes to force a game 6 back in Denver. Bryant and Ramon Session missed potential game tying threes on the final possession of the game. JaVale McGee had the best game of his young career with 21 points, 14 rebounds, and 3 blocks. Andre Miller went to work scoring 24 points and dished out 8 assists. Kobe Bryant had another big night scoring 43 points, including four straight 3-pointers late in the fourth to bring the Lakers back.